Those behind the Shinnecock Bay Restoration Program, an initiative that seeks to cleanse the water in the western side of the bay through the introduction of shellfish, recently celebrated a milestone: the seeding of its one millionth clam. Led by Christopher Gobler, Ph.D, a professor at Stony Brook Southampton, the program now boasts 20 hard clam sanctuaries in the bay, each containing 50,000 clams. The sanctuaries cover roughly a half acre of the bay, he said. Though one million is an impressive number, Dr. Gobler said the goal continues to be to reseed Shinnecock Bay with 33 million clams and other types of shellfish, with the next million clams being in place by late 2016 or early 2017. Clams are natural filters, helping cleanse water that has too much nitrogen—a common problem in the western regions of the bay. According to Dr. Gobler, clams can start to reproduce when they reach 2 to 3 years of age, and do so by spitting gametes into the water. One they are released, they require adult clams to be in the area, to ensure the completion of the reproduction process. Also assisting with the success rate is that clams, if not harvested, can live for decades. 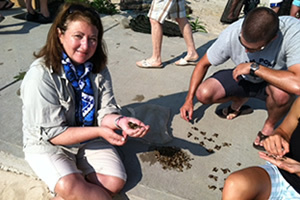 When he first started researching the issue nearly 10 years ago, Dr. Gobler noticed that the few clams inhabiting Shinnecock Bay were spread too far apart, reducing their chances for successful reproduction. That research inspired him, with the help of Dr. Brad Peterson, to start the current program in 2012. A professor at Stony Brook since 2006, Dr. Peterson explained that he and Dr. Gobler figured they could immediately start addressing the issue of nitrogen-loading in the bay through their clam restoration program. If his team must seed all of the clams, Dr. Gobler estimates that it would take about a decade to hit the 33 million mark. That time could be cut down considerably if the adult clams start to successfully reproduce. He noted that 33 millions clams could filter all the water in Shinnecock Bay in about three days. Over the past few decades, the water quality in the bay has been on the decline. The continued reappearance of brown and red tides, according to Dr. Gobler, continue to wreak havoc in the bay and all forms of life that call it home. He pointed out that, earlier this year, the shellfish fishery was closed off due to the presence of red tide. It was the third such closure in the past five years. Another important aspect to ensure the ongoing success of the program is to continue to raise awareness, Dr. Gobler said. The East Quogue resident said he works with students at all levels, from elementary school to graduate school, to help foster education. In the fall, students from Hampton Bays and Southampton high schools helped stock one of the sanctuaries by planting 50,000 clams. Dr. Stephanie Forsberg, a science teacher at the Hampton Bays High School, took 18 students on that field trip. She recalled the students being fascinated while learning how clams, as well as other shellfish, serve as filters and help clean bay water. Some of the students wanted to dissect clams to learn more about the process. Dr. Demian Chapman holding a silky shark in the Bahamas. Sharks have long been the sea's scariest creatures, but now they find their very existence threatened as scientists work to save these misunderstood monsters. It’s 8:26 am when the R/V Shinnecock pulls in its first trawl—a juvenile horseshoe crab and baby tautog. Bluefish are flitting at the surface of Shinnecock Bay, and the eight-person crew from Stony Brook University’s School of Marine and Atmospheric Sciences (SoMAS) is out this morning to catalog the bay’s water quality and life. There’s devotion among the scientists and volunteers on this 35-foot platform research craft. They started this project in 2012 with a clear vision—to take care of what’s happening in the Long Island university’s aquatic backyard and to see how to protect and improve it. 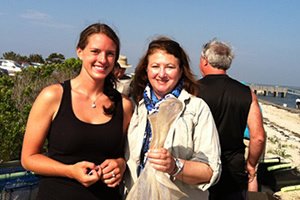 A second and third trawl reveal striped sea robins, anchovies, shrimp, comb jellies, and a half-dozen varieties of crab. Other days, they’ll be joined by stingrays, fluke, and grouper. But these are small fish in a vast pond. They’re only half of the story. The other half is sharks. Forty years ago, Peter Benchley’s Jaws transformed Long Island into shark central. Inspired by the real-life story of shark hunter Frank Mundus, who claims to have harpooned a 4,550-pound great white off Montauk Point in 1964, the novel was set in the fictional town of Amity, allegedly somewhere between Bridgehampton and East Hampton. By the time Steven Spielberg’s adaptation followed a year later, the book had already sold 5.5 million copies and spurred a worldwide fascination with hunting sharks. Spielberg’s film changed cinema, introducing film’s first blockbuster and creating a feeding frenzy of fear and concern. But by the time Benchley died in 2006 and Mundus passed away two years later, both had taken up a new fight: Each had become a staunch conservationist. Half of the world’s shark fins pass through the ports of Hong Kong, making their way to mainland China and elsewhere, many to be bleached and shredded for shark-fin soup. It’s a long-standing practice, but a complicated one, and in 2009, Chapman and his colleagues developed a DNA-testing technique to trace the fins back to their region of origin. He then expanded the testing to other species to better understand the complex nature of the global trade. After the initial craze waned, though, developments overseas spurred on the hunt. “By the 1980s, the Chinese economy grew, and that had nothing to do with Jaws,” Chapman continues. “There was a new middle class with plenty of disposable income, and the luxury product they wanted was soup, which can cost $100 a bowl in restaurants.” Complicating matters, the United States Fisheries then pushed American fishermen toward catching sharks, both to answer the new demand and to protect other fish species that had become depleted. Between 2000 and 2004, CITES, the Convention on International Trade in Endangered Species of Wild Fauna and Flora, and its 180 member countries added great whites, whale sharks, and basking sharks to its list of animals that had to be protected worldwide. But stopping them in customs remained a problem because it was difficult to tell the 400-plus shark species apart. “Finning”—cutting fins from the sharks and then leaving the mutilated creatures to die—was the preferred harvesting approach, because it left fishing boats’ freezers open for more valuable catches, like tuna. In some cases, fishermen would even slice the fins from females, removing embryos and taking their tiny fins as well. Efforts to add additional shark species to the endangered species list were similarly hindered because the task of telling the fins apart seemed insurmountable. But in 2012, Chapman and his wife, Debra Abercrombie, developed a fin guide, based on simple visible physical differences. “We taught ourselves how to identify them, traveling the world and looking at sharks, and making sure there weren’t variations among the species in different areas,” Chapman explains. Funding came from the US government and the Pew Charitable Trust, and the pair displayed the fins and their guide (available at sharkfinid.com) to delegates at the CITES conference in Bangkok in 2013. Three hammerhead species, porbeagles, and oceanic whitetips were added to the list along with all manta rays. Those regulations take effect worldwide this September 14. But back to Chapman’s bag. He’s wheeled it through airports around the globe, showing it to customs officers at ports. “I spend a lot of time doing paperwork,” Chapman admits, “but you can get through customs pretty easily with a good story, and I’ve got one.” Chapman explains that in one hour he can train a customs officer to spot illegally sourced fins and that the training is inspiring people to want to do their part. “They see how easy it is to make a big difference with a global problem,” he says. Chapman—whose grandfather had a shark tattoo on his arm—became interested in sharks as a child in New Plymouth, New Zealand, but it changed when he met Ellen Pikitch, a Bensonhurst, New York, native who grew up mesmerized by fish on summer outings to Coney Island. Pikitch was the founding director of the Wildlife Conservation Society’s global marine conservation program, headquartered at the New York Aquarium and then at the Bronx Zoo. She met Chapman while doing fieldwork in the Bahamas and later hired him to run the Institute for Ocean Conservation Science’s shark research program in 2007. In 2008 she moved the institute to Stony Brook University’s main campus, where she and Chapman are SoMAS professors as well. Pikitch’s groundbreaking career includes leading the scientific efforts for beluga sturgeon to be listed on the US Endangered Species Act (at one time, Americans consumed 80 percent of its caviar each year). This resulted in the banning of all US imports of the fish in 2005, saving a fish heading toward extinction. She also helped lead a 2009 study of forage fish—prey species like sardines, herring, anchovies, and bunker—which according to statistics shows that direct fishing for these species constituted one-third of the world’s marine catch, and that by removing them from the ocean, we were endangering the larger fish we rely on for human food. 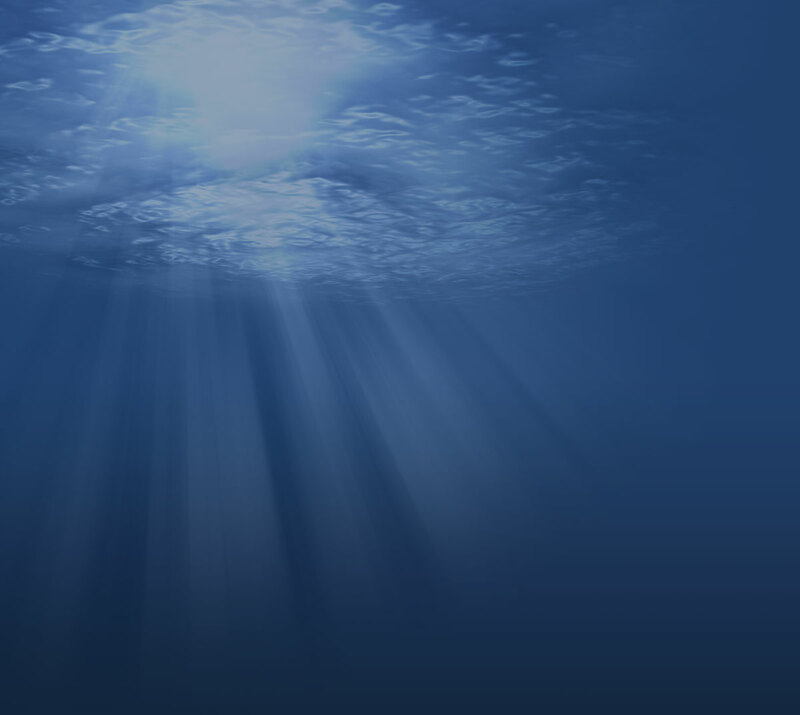 The research has led to changes in fishery policy worldwide. Closer to home, Pikitch coleads the Shinnecock Bay Restoration Program, which is funded by a $3 million, five-year grant from the Laurie Landeau Foundation (matched by Stony Brook’s Simons Foundation) to study and restore Shinnecock Bay, which has been undergoing increasingly harmful algal blooms. In addition to the trawls, the work includes stocking 20 half-acre underwater sanctuaries with 50,000 hard-shell clams, establishing oyster beds (both bivalve species filter water, with a single oyster filtering up to 50 gallons per day), and planting eelgrass, which serves as a habitat for scallops and young fish. Southampton residents can even participate in the oyster program, in a joint effort between SoMAS and Southold’s Cornell Cooperative Extension. Chapman and his students, Mark Bond and Jasmine Valentin, operate a “chum cam” in Belize to see how marine reserves benefit sharks. These data are used to help support development of other protected areas for sharks, including the Bahamas, where all shark trade was banned in 2011 and shark-related tourism now contributes $78 million annually to the economy (with each shark producing up to $3 million in ongoing revenue in its lifetime). In Montauk, alternatives have emerged thanks to things like cage diving with Sea Turtle Dive Charters. 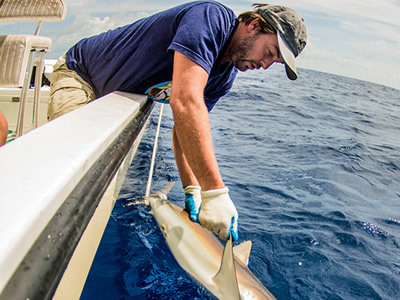 This summer, Abercrombie will accompany local fishermen to tag shortfin mako sharks with satellites off of Long Island, growing their influence in the region and working to preserve the delicate but essential ecosystem. Back on the R/V Shinnecock, Konstantine Rountos, a freshly minted SoMAS PhD, is examining a pair of mating green crabs. This fall, he’ll start a postdoc at SoMAS after designing first-of-their-kind experiments on the effects of red tide on the early development of fish. Sara Cernadas-Martín from Spain is alongside him, taking samples of the crabs’ flesh before releasing them back into the bay. Black cormorants greet us on the dock as we step ashore at Stony Brook’s Marine Sciences Center in Southampton, an $8 million, 15,000-square-foot facility that opened in September 2013. A 2,400-square-foot outdoor wet lab for studies that need natural light sits outside, while an indoor seawater lab holds 17 tanks for experiments, plus 10 more for studying algal blooms. Powered by a 100-gallon-per minute pump, the entire array can bring water in from the bay, or use a closed, filtered flow that can be further adjusted by tweaking the calcium levels, salinity, and temperatures to satisfy any scientist’s parameters. The first experiments began this summer. A second floor features classroom labs and a conference room with enviable views of summer homes, resident swans, and the water. There’s work to be done in Shinnecock Bay and in oceans around the world, but it’s impossible to stand in these halls and not feel that Stony Brook’s fleet of scientists is making a difference. 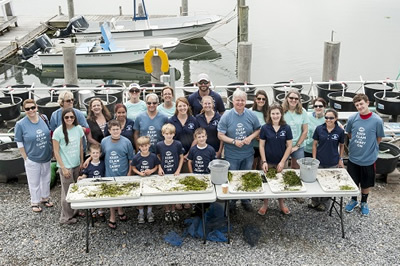 Assemblyman Fred W. Thiele Jr. and volunteers “Keep Clam and Carry On.” The group handled 8,200 reproductive shoots, each containing roughly 50 seeds. SOUTHAMPTON, NY, June 18, 2014 – On Saturday, June 14, East End volunteers worked side-by-side with members of the Stony Brook University School of Marine and Atmospheric Sciences, (SoMAS) to help revitalize Shinnecock Bay. More than 40 residents, friends and neighbors were on hand at this second annual event to help improve the Bay’s condition by restoring eelgrass habitat into areas where it has disappeared. The event occurred in three phases. The first phase was harvesting adult reproductive eelgrass shoots from the bay by Peterson and his team. Next, volunteers separated thousands of eelgrass shoots in water-filled tubs, looking at each individual piece for seeds. The fertile ones were piled into mesh bags, which were then tied mid-line to a cord, anchored by a cinder block and affixed with a buoy at the top for identification. Last, the bags were brought out in to the Shinnecock Bay and installed at various drop points. 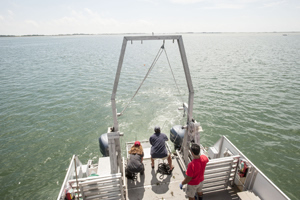 The Buoy-Deployed Seeding System (BuDS), originally developed by the Cornell Cooperative Extension, will allow the seeds to be dispersed in mid-water and offer the greatest chances for success. The group handled 8,200 reproductive shoots, each containing roughly 50 seeds, for a total of approximately 410,000 seeds being dispersed this season. “We’re doing our best to combat problems in Shinnecock Bay and restore it to a place with clean water and healthy marine life,” said Santora. With the help of the local community, the bay will be one step closer to being a more vibrant habitat. Celebration will include a reception and an interactive educational experience led by scientists and students from the School of Marine and Atmospheric Sciences at Stony Brook University. 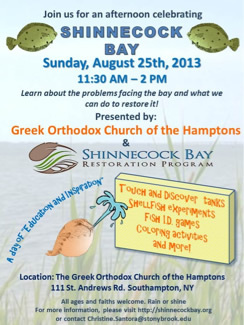 Southampton, NY, August 16, 2013– On Sunday, August 25 at 11:30 am, the Shinnecock Bay Restoration Program (ShiRP), an initiative of Stony Brook’s School of Marine and Atmospheric Sciences (SoMAS), will partner with the Greek Orthodox Church of the Hamptons to offer a public educational event that will raise awareness of the Church’s concern for and stewardship of the environment, and of Shinnecock Bay and the efforts to restore it. The general public is invited and encouraged to attend. The event will feature educational activities such as touch tanks and shellfish experiments, as well as a brief talk by one of the program’s lead scientists. Students and project staff will be on hand to interact with the public, showcase life in the bay, and explain their research efforts to understand and restore the bay. Dr. Ellen Pikitch, a professor at SoMAS and executive director of its Institute for Ocean Conservation Science, who is co-principal investigator of the ShiRP program, will give an overview of the project. The Shinnecock Bay Restoration Program is an effort through Stony Brook University to balance, restore and protect Shinnecock Bay, which has been negatively affected by harmful algal blooms, chemical inputs, and reduced shellfish populations. ShiRP marine biologists assess the causes of impaired water quality, and work to understand the impacts to the ecosystem’s species and habitats. They have carefully crafted a plan to replenish native shellfish and eelgrass meadows in the bay, and will monitor improvements in water quality and fish populations as the restoration progresses. Community members are welcome at this event, which will take place rain or shine. Refreshments will be served. For more information about this event, please visit http://shinnecockbay.org/news-events/events.html or contact Christine Santora, ShiRP Coordinator at Christine.Santora@stonybrook.edu. The Greek Orthodox Church’s annual day of observation toward the natural environment dates back to1992, when Ecumenical Patriarch Bartholomew, whose environmental conservation initiatives have earned him the title of The Green Patriarch, led the worldwide church in formally endorsing September 1st as a day of universal prayer and thanksgiving for the natural environment. Stony Brook, NY, July 23rd 2013 – The harmful brown tide that has plagued various sites across the south shore of Long Island since the spring is in its final throes. The 2013 brown tide began in the Shinnecock and Moriches Bay in May, and then erupted in late June in Great South Bay following unusually heavy rainfall in the beginning of that month. A survey through Long Island’s South Shore Estuary Reserve from Southampton to Bay Shore performed by The Gobler Laboratory of Stony Brook University has revealed that a during the week of July 15th, cell densities had declined from millions to tens of thousands of cells per milliliter compared to the start of the month. 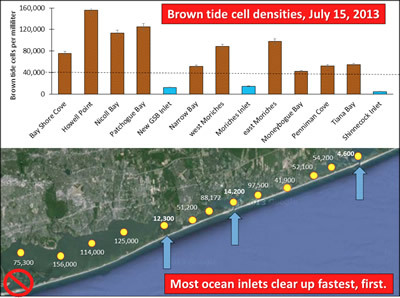 Sites located near the Shinnecock, Moriches, and New Inlet in Great South Bay had the lowest abundances (< 10,000 cells per millimeter) while some regions in central and western Great South Bay still had more than 100,000 cells per millimeter. Densities above 50,000 cells per milliliter can be harmful to marine life. The brown tide alga, Aureococcus anophagefferens, has been notorious on Long Island since it first appeared in 1985 having been responsible for the demise of the largest bay scallop fishery on the US east coast in the Peconic Estuary, the loss of eelgrass across Long Island, and the inhibition of hard clam recovery efforts in Great South Bay. This year marked the seventh consecutive year these destructive blooms have occurred in the Moriches and Shinnecock Bay but the first event in Great South Bay since 2008. Gobler further commented that the brown tide should remain at low levels for the remainder of the summer, but could return in the fall when the bays cool down to ~70°F. SOUTHAMPTON, NY – July 9, 2013 –Stony Brook University Professor Ellen Pikitch, a renowned expert in marine biology and conservation; Christopher Scott and Elyssa Hopkins, currently students in the Marine Conservation and Policy program in the School of Marine and Atmospheric Sciences at Stony Brook, were among the volunteer oyster gardeners gathered at the Tiana Beach Community Oyster Garden, where each received 1000 baby oysters (spat), which they will nurture to maturity. 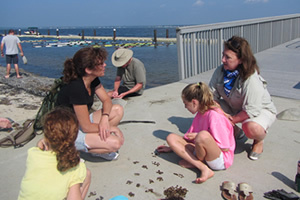 A number of the oyster gardener volunteers were recruited by the Shinnecock Bay Restoration Program (ShiRP), which was founded by the Stony Brook University School of Marine and Atmospheric Sciences (SoMAS) and its Institute for Ocean Conservation Science. 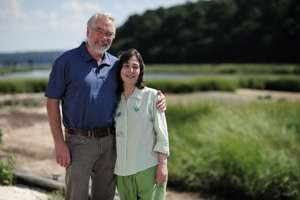 “Restoring Shinnecock Bay requires dedication and a hands-on approach by scientists and residents in our communities,” said Dr. Pikitch, Executive Director of IOCS, ShiRP co-principal investigator (with SoMAS Prof. Christopher Gobler) and a Town of Southampton resident. At the end of the season the oyster gardener volunteers will produce their fully matured oysters to be planted by SBU students in special oyster beds, where they will filter water in Shinnecock Bay, improving water quality and helping to fight both brown and red tides. One adult oyster can filter and clean up to 50 gallons of water per day. The ShiRP volunteer oyster gardeners will work under the program, Southold Project in Aquaculture Training (SPAT), which is sponsored by the Cornell Cooperative Extension of Suffolk County, the Southampton Town Trustees and Town of Southampton Parks and Recreation Department. The goal of the Shinnecock Bay Restoration Program (ShiRP) is to use science, outreach and partnerships to restore the water quality and fisheries of Shinnecock Bay. The bay is the eastern-most lagoon along New York’s South Shore Estuary system. Its aquatic environment – 9,000 acres of open water, salt marshes and intertidal flats – forms a regionally significant habitat for fish shellfish, and waterfowl. In August 2012, ShiRP received a generous philanthropic gift from the Laurie Landeau Foundation* matched by a gift from the Simons Foundation for a total impact of $3 million. 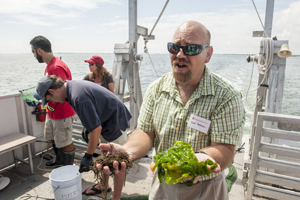 These targeted funds are being used by Stony Brook’s School of Marine and Atmospheric Sciences (SoMAS) over five years to restock shellfish, expand existing eelgrass beds, harvest seaweeds to absorb nutrients and inhibit harmful algal blooms, monitor restoration efforts and share the project’s goals and results with stakeholders and the public. * The Laurie Landeau Foundation is an arm of a larger 501(C)3 which was established from the estates of Ralph and Claire Landau, and is primarily dedicated to philanthropy for scientific institutions and science museums. Southampton, NY, June 7th 2013 – A brown tide has emerged within some, but not all, of Long Island’s south shore estuaries. Monitoring by The Gobler Laboratory of Stony Brook University’s School of Marine and Atmospheric Sciences has revealed that a brown tide has developed in eastern Moriches Bay, Quantuck Bay, and western Shinnecock Bay. Abundances of the brown tide organism in this region progressively increased through the month of May and were recorded at maximal densities of more than 800,000 cells per milliliter in western Shinnecock Bay as of June 1st. Densities above 50,000 cells per milliliter can be harmful to marine life. The brown tide alga, Aureococcus anophagefferens, has been notorious on Long Island since it first appeared in 1985 having been responsible for the demise of the largest bay scallop fishery on the US east coast in the Peconic Estuary, the loss of eelgrass across Long Island, and the inhibition of hard clam recovery efforts in Great South Bay. This marks the seventh consecutive year these destructive blooms have occurred in the Moriches-Quantuck-Shinnecock Bay system. 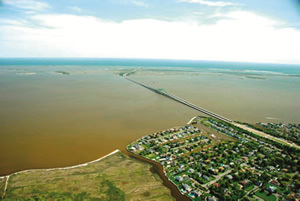 While brown tides have also occurred in Great South Bay as recently as 2008 and 2011, the presence of a new ocean inlet in eastern Great South Bay that formed during Hurricane Sandy may be assisting in keeping the blooms away in 2013. Brown tide in Great South Bay during June of 2008, prior to the formation of the new inlet. Photo courtesy of Suffolk County. Dr. Christopher Gobler, Professor within Stony Brook University’s School of Marine and Atmospheric Sciences whose laboratory generated the brown tide data, indicated that the distribution of this year’s brown tide comes as good news to some and bad news to others: “The absence of a brown tide in Great South Bay may be a ‘Gift from Sandy’. Since the new inlet was created following the Hurricane Sandy, we’ve seen higher salinity, lower chlorophyll, lower nitrogen, and stronger flushing in eastern Great South Bay. The inability of the brown tide organism to form a bloom in this region is consistent with these conditions and should help promote the growth of hard clams and eelgrass in this bay,” Gobler said. The news for the eastern regions of the Long Island’s south shore was not as good. “The combination of poor flushing and intensive nitrogen loading into the eastern Moriches-western Shinnecock Bay region makes it highly vulnerable to algal blooms. We had hoped that the cooler spring and the efforts of the Shinnecock Bay Restoration Program to restock filter feeding shellfish in the Bay might restrict this year’s bloom. We are still hopeful that these filter feeders may make this year’s bloom will be less intense in this region than is has been in recent years”, said Gobler noting that in 2011 and 2012, cell densities of the brown tide were more than twice as dense as the current bloom at two million cells per milliliter. 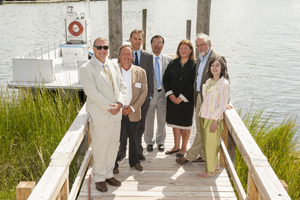 Officials at the Stony Brook Southampton Marine Sciences Station gather to announce $3 Million in gifts from the Landeau Foundation and Simons Foundation to fund the Shinnecock Bay Restoration Program. From left to right: SBU President Samuel L. Stanley Jr., MD; Richard Gelfond, Chair, Stony Brook Foundation Board of Trustees; Christopher Gobler, Professor, SoMAS; Minghua Zhang, Dean, SoMAS; Ellen K. Pikitch, Professor, SoMAS; and Bob Maze and Laurie Landeau of the Landeau Foundation, LLC. The once rich shellfish beds of Shinnecock Bay may thrive again thanks to an ambitious environmental restoration project funded in part by a philanthropic gift from the Laurie Landeau Foundation matched by a gift from the Simons Foundation for a total impact of $3 million. These targeted funds will be used by Stony Brook’s School of Marine and Atmospheric Sciences (SoMAS) over five years to restock shellfish, expand existing eelgrass beds, harvest seaweeds to absorb nutrients and inhibit harmful algal blooms, monitor restoration efforts and share the project’s goals and results with stakeholders and the public. The Laurie Landeau Foundation is an arm of a larger 501(C)3 which was established from the estates of Ralph and Claire Landau, and is primarily dedicated to philanthropy for scientific institutions and science museums. The goal of the Shinnecock Bay Restoration Program is to use science, outreach and partnerships to restore the water quality and fisheries of Shinnecock Bay. The bay is the eastern-most lagoon along New York’s South Shore Estuary system. Its aquatic environment – 9,000 acres of open water, salt marshes and intertidal flats – forms a regionally significant habitat for fish shellfish, and waterfowl. 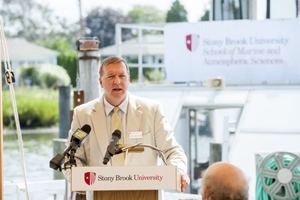 Stony Brook University President Samuel L. Stanley Jr., MD, at the Shinnecock Bay Restoration Program announcement. During more than a decade of research in Shinnecock Bay, SoMAS scientists have documented the decline in the Bay’s water quality, shellfish populations and seagrass habitats. Using information acquired during Shinnecock Bay Restoration Program pilot studies which began in 2010, Stony Brook University scientists identified the reasons for those declines as well as approaches on how to reverse these trends and improve the ecological condition of this system. Through these pilot studies, researchers identified which species or strains of shellfish or eelgrass will be best suited to help restore Shinnecock Bay. Laurie Landeau of Northport, an aquatic animal veterinarian, and her husband, Bob Maze, a PhD in ecological parasitology, became aware of the restoration project in Shinnecock Bay when they came to Stony Brook Southampton as invited faculty to offer a four-week “AQUAVET®” course (Introduction to Aquatic Veterinary Medicine). It was there that they learned of the unique opportunity to impact the marine estuary environment guided by the research and work of prolific marine scientist Christopher Gobler and his team of Marine Science faculty, post docs, graduate students and undergraduates. Landeau and Maze, also operate Marinetics on the Eastern Shore of Maryland, which raises oysters in rafts on the surface of the Choptank River. Over-harvesting and degradation of the Chesapeake’s ecosystem had virtually wiped out the wild oyster population there. Marinetics began as a commercial aquaculture company with a mission to produce a high quality oyster that is healthier for the consumer, while also helping to improve the health of the Chesapeake Bay. Now operating as The Choptank Oyster Company, it has grown into a thriving oyster farm that produces an average of 1 to 2 million oysters per year. 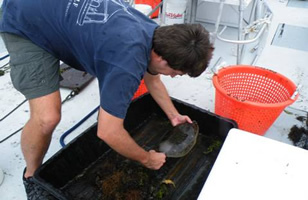 Stony Brook University researchers trawl Shinnecock Bay aboard the Research Vessel Peconic. "We applaud the Landeau Foundation's vision in supporting the Shinnecock Bay restoration project," said Marilyn Hawrys Simons, Ph.D., President of the Simons Foundation, which in December 2011 announced a $50 million Challenge Grant that accompanied a $100 million personal gift to Stony Brook University from Jim and Marilyn Simons. The Challenge Grant was dedicated to inspire and encourage others to invest in the future of Stony Brook University. "The Simons Foundation is delighted to add its help to this important project." Heading the efforts to restore the Bay for SoMAS are Gobler, whose research focuses on aquatic ecosystems and how their functioning can be effected by man or can affect man, and marine biologist Ellen Pikitch, Professor and Executive Director of the Institute for Ocean Conservation Science in the School of Marine and Atmospheric Sciences at Stony Brook, whose research is focused on ocean conservation, fisheries management, ecosystem-based approaches, endangered fishes, sharks and sturgeon. Stony Brook University Marine Sciences Professor Brad Peterson, a co-investigator in the Shinnecock Bay Restoration Program, displays plant life secured during a trawl in Shinnecock Bay. "This research and restoration initiative will not only rehabilitate this waterway, but will serve as a model for other communities who have seen similar decline in their estuaries. The partnership of community, science and philanthropy will have far-reaching benefits," said Senator Kenneth P. LaValle. "The health of this waterway is connected to the health of our community. We need a thriving waterway to support a thriving economy, tourism and recreational activity." Assemblyman Fred Thiele stated, "Shinnecock Bay is a valuable and unique economic and environmental resource here on the East End. The Marine Science Program is playing an active role in developing a restoration plan to ensure that we will continue to benefit from the Bay and its resources. This tremendous gift will enable the Stony Brook Southampton Campus to play a significant role in addressing local issues. I look forward to seeing the University expand its role in the community."